Last night (October 3) we celebrated our annual Accomplished Under 40 award winners at the Tetherow Pavillion. This year we have selected 22 inspiring young leaders to award. One of the nominators asked me this year, “Does everyone who is nominated get awarded?” My answer was, “No, we do not base the award on how much money you make, or how many people you manage. While those can be a factor, the biggest thing we look for is community service.” The award team looked at all of the nominations and there were a few this year that just didn’t have enough “community service”. While they may be high quality individuals and may have served on a board, it was more for their industry rather than community. This year we honor people from many different industries, and even ages — I believe we have the youngest award winner in our long history of this event. I want to thank U.S. Bank for stepping up as our presenting sponsor this year as well as the nominees and nominators, without all of you we couldn’t make this event as special as it is. 1. Development of on-going and new volunteer leaders in the Central and Eastern Oregon Chapter (earned 2018 mission fulfillment award for this work). 2. Growth and development of services available to the communities in the Central and Eastern Oregon Chapter. In Union County we have increased our offering of the Pillowcase project, last year presenting to every public fourth grade class in the county. We are continuing this work and this year will be increasing to include all private and home schooled fourth grade classes in the county. Following this year, we will have presented to every fourth grade student and will continue to do so every year following. 3. Trained and deployed regionally to support disaster relief operations and develop skills in Information and Planning culminating in my application and admittance to the Divisional Response Management Team (DRMT). The DRMT is a group of trained individuals in certain areas that agree to deploy nationally to support operational management of a large scale disaster response. Alaina covers a large territory in Central and Eastern Oregon, working with volunteers and emergency response teams ensuring that communities within her region are prepared and are cared for before and during potential disasters. Alaina is one of the youngest Disaster Program Managers at the American Red Cross. She has a Masters in Emergency Management and has surpassed the expectations of her position with her response efforts, volunteer retention and community involvement campaigns. I firmly believe in a collaborative leadership style. Every individual has ideas and priorities on what is the best way to move forward. Through collaborative discussion and sharing of ideas and priorities we can develop a plan that is the most effective and in alignment with the mission and philosophy of the organization. About three years ago Andy cashed in everything and bought his own business doing a 180 degree turn from what he had been doing with the builders association to buying a company with 20 plus employees that works with well pumps and agricultural irrigations systems. Thompson Pump and Irrigations has been around since 1964 and Andy and his wife are the third owners in its 54 year history. Andy focuses on taking care of his employees by paying for full medical benefits for his employees and their families. He would like young people to know they can have a very good career by building on a trade. Andy focuses on growing the company and finding ways to improve his business systems without sacrificing service to Thompson Pump and Irrigation customers. He believes if you take care of your employees, they will help take care of the business and the customers. Taking care of customers or in his previous life, taking care of members, it is important to be honest and fair even if it may not be what you want to hear. Ashley has been with U.S. Bank since November 2012. She has received the following awards: Frequently recognized as Top Performer in Equipment Finance Lending (Platinum Level – 2017, 2016, 2015), U.S. Bank Quarterly Pinnacle Award Winner (Q2 and Q3 2016), U.S. Bank 2016 Spring Campaign Award Winner, U.S. Bank Quarterly Banker Star of Excellence 4x’s, and is frequently asked to be a Guest Speaker for National Pricing Calls focusing on Top Producers in the Equipment Finance category (2016 and 2017). Ashley is a successful financial expert with 15 years of industry experience. She currently holds the role of Assistant VP, Business Banking Relationship Manager. As always, she displays a high degree of integrity, responsibility and ambition towards her career and the teams she supports within US Bank. Ashley has also shown she is a true leader, not just in her local branch but in her community as well. Ashley is a dependable, self-motivated team player with sound judgment. She is an outstanding advocate for her customers and U.S. Bank and her business outlook ensures a logical and practical approach to her endeavors. Briana was hired as a Junior Interior Designer at Pinnacle Architecture after graduating from Portland Art Institute in 2006. She steadily worked and learned her way to an Associate Principal position. Briana’s involvement in the firm’s strategic planning and driving change, resulted in an ownership position and the next generation of leadership. Briana donates interior design services to nonprofits: The Shepherd’s House Ministries, Abilitree, and Ronald McDonald House. She served on the City of Redmond Planning Commission for one and a half years. Briana is the sole interior designer in our architecture office. She’s learned design skills beyond what her role typically requires to better support the firm. Briana has taken on a business and leadership role that is shaping the future of Pinnacle. Briana is the perfect combination of listener, advisor, and fixer. She wants her clients to be proud of their projects and her coworkers, successful. When she identifies an issue, she brings people together to find a solution that works best for all – whether updating an inefficient office process or solving a problem during construction. Bud started and sold an app company in 2012, and then started Mazama Media, one of Central Oregon’s leading digital marketing agencies in 2013. Bud has successfully managed and operated Mazama Media as CEO, bringing it to be the 2nd fastest growing company in Central Oregon in 2017. He is on the Facebook Small Medium Business council, The Forbes Agency Council, among others. He is a passionate CEO, and strives to create a great workplace in Central Oregon. He’s very active in the business community giving free seminars often to teach other business owners how to create meaningful advertisements to boost their business. He is part of TAO (Technology Association of Oregon), and a board member of the nonprofit OIM (Oregon Innovative Marketers). Bud is very smart and data driven, but at his core he is also incredibly caring. He knows the value of his team, and often sings praise to them, not taking the credit of the company’s success on himself or co-founder but attributes it to the people who make the wheels turn in the office. He reads A LOT, anything from self-help to leadership strategy to philosophy. He is constantly trying to better himself as a person and as a leader. Bud’s goal in life is to create a stress-free workplace. His philosophy has always been that life comes first. Don’t live to work. He really strives to become a leader in Central Oregon’s business economy. He develops meaningful relationships with clients and his internal team. One thing that makes Bud stand out is his desire to create leaders from everyone in the company. Instead of offering up only answers, he challenges people to think critically and better themselves professionally each day as well. Gwen has served as a Deputy District Attorney for the State of Oregon, is currently the Bend Municipal Court Judge, and is a Partner at the Family Law Firm, Phillips & Moore where she practices collaborative family law and is an extremely talented mediator. Gwen has graduated from Leadership Bend and, in addition to everything else, is a licensed real estate agent with Berkshire Hathaway. Gwen is currently a member of the Deschutes County Domestic Violence Council. Additionally, she has served as a Board member with the Central Oregon Humane Society, however, needed to resign from that position in order to be the Bend Municipal Court Judge. She has also served as a member of the Oregon State Bar’s Family Law Section. Gwen’s work ethic, professionalism, compassion, and drive while maintaining a reserved but confident demeanor is striking. She can control a courtroom and resolve difficult and emotional disputes, while at the same time ensuring fairness, integrity, and just outcomes in all of her work. She is able to achieve successful outcomes in these difficult areas with a calmness and kindness that is unparalleled. Gwen leads by example. Her philosophy centers around fairness, treating people respectfully, and quietly commanding respect herself. She does so unassumingly and with heart. If you ever meet Gwen, you may not guess that she is a Judge and a Partner at a law firm at first. However, if you were to do business with her you would feel that you received the best representation available and understand how she has been able to achieve all that she has before reaching the age of 40. Jeremy holds a BS and MBA from OSU and is the owner of Riverview Tax & Accounting PC. His background is diverse, ranging from Fortune 500 to tech startups and managing investment companies. He is now able to help clients leverage his experience and focus on helping them take their passions, turn them it into a livelihood and beyond. Jeremy serves on the Boys & Girls Club of Bend board and is a member of the Rotary Club of Bend, AICPA, OSCPA and Bend Chamber, BNI, is a BNI Ambassador as well as a volunteer for various charities. Jeremy takes a unique and critical interest in his clients. He has the diverse background and experience to offer opportunities and thoughtful solutions to them. He recognizes that people and businesses are all different and answers need to be specialized. Jeremy focuses on his clients’ “why” and works to help them fill in the details to get there. Business owners are usually excellent technicians, constantly honing, refining and enjoying their craft. He recognizes they need support to do that and helps them put in the building blocks to succeed. Jordan is the Co-Owner of Assist-2-Sell Real Estate in Bend, a company that offers affordable real estate services to buyers and sellers throughout Central Oregon. With the belief that selling your home shouldn’t cost you your equity, Jordan works tirelessly to offer a quality real estate experience that is informative and fun. Jordan brings a great amount of professionalism to his work and is known for his honestly and sincerity. These traits have gained him his business and have allowed it to grow and thrive. Jordan is 100% customer focused and knows that it’s the customer not the money that matters in business. Jordan believes in giving back to the community. Jordan is a volunteer for Junior Achievement and works in classrooms throughout Central Oregon helping to educate young people about financial literacy, work readiness and entrepreneurialism. Jordan is hard working and well respected by his peers and his customers. Jordan is thoughtful in all his professional encounters and applies his knowledge and skills to every sale; always putting the customer first and saving them as much of their hard earned money as he can. Jordan is kind and his integrity knows no bounds. He can juggle a work, life balance with ease that leaves everyone he encounters feeling like they are his top priority. Kara is always on top of organization, promoting community events and participation, and always a very involved in the leadership of the Redmond community. She is often hard at work putting together big events for the community and in turn promoting a close-knit community and business involvement. Both business owners and community members alike would say Kara is incredibly helpful, gives a great fresh perspective on things, and will go the extra mile to make Redmond shine. We are so proud to have her as a co-worker and a leader in our community. She is there working tirelessly behind the scenes to make all the working pieces come together, flawlessly. The Bacon Brew and Balloons event was a HUGE success due to her. The business ribbon cuttings and coffee clatters are becoming even more popular due to her push for area involvement. She is always on point, going that extra mile to make the community and the local businesses get involved and take pride in the city we love. She is always trying out new and fresh ideas to improve our events and businesses. She goes above and beyond her role as an events director. Kara leads coffee clatters on a weekly basis and emphasizes the importance of community and business leader involvement in Redmond. She is also involved in ribbon cuttings and business after hours where she really shines by helping businesses to have a great grand opening and fantastic networking event. Lara is a Licensed Property Manager, Owner of Cherry Properties Mgmt., LLC, as well as owns and manages local small business. As a Business and Technology Assistant for the University of Utah, she single-handedly saved the university thousands of dollars per month through record cleanup and organizational efforts. Sonar Technician serving the U.S. Navy with Global War on Terror and Operation Iraqi Freedom. Lara was on the Media/Social Media team, during the 2016 presidential campaign. She was a volunteer with the SLC Rescue Mission, a command ombudsman with the Naval Commander Amphibious Squadron Six, as well as having a leadership position at a local faith-based organization. Lara is a strong, intelligent, motivated leader. She is a veteran and a single mother. She makes time to care for her two children, work full-time, and has recently started her own company, while still giving back to the community she loves. She is a go-getter, who never gives up. Lara believes businesses are only as good as their employees. She believes businesses must take care of their employees with living wages, benefits and constant focus on morale. Businesses must also give back to their local community. Certainly profit is not the sole measure of a successful businesses. Laura is founder and CEO of ColeBreit Engineering (CBE), the leading mechanical engineering firm in Central Oregon, with 11 employees and offices in Bend and Corvallis. Her firm works with owners, builders and architects throughout the North West to facilitate the growth of companies and industries vital to our community. Laura is involved with the Bend Rotary Club, Bethlehem Inn kitchen remodel and is on the boards of both the Growing Tree Children’s Center and Celebrate Cannabis. Laura understands the importance of community and the positive impact her company plays in enriching the lives of the people that work at ColeBreit as well as the companies and individuals that work with ColeBreit. Laura understands that ColeBreit positively influences and grows existing and new industries within Central Oregon. Laura is a devoted servant leader and understands that the people in her team and the people that work with ColeBreit are best served through a win-win mentality. Her focus on a company culture based on Level 5 leadership, rewards success and challenges individuals to grow professionally and personally. Luke is a commercial property manager and licensed broker in the state of Oregon. He is a member of the Institute of Real Estate Management specializing in leasing industrial, retail and office properties, managing over 275,000 square feet. His client-focused approach has resulted in increased values of client’s assets. Luke serves on the Board of Director’s for Deschutes Children’s Foundation fulfilling his desire to give back to the community that he was raised in. Luke truly listens to his clients to better understand their unique needs. He is dedicated to assisting them achieve top value for their commercial real estate assets, no matter the size of the property. He collaborates with owners and tenants to create synergy throughout each managed property. Luke’s business leadership philosophy is to surround himself with admirable people, as he believes you are truly a product of your environment, and to treat everyone he comes across with the highest level of integrity and civility. Matt is currently the GM for Cascade Indoor Sports and has been with them for six years and manages all of the youth and adult soccer programs, flag football and is the New GM for 18th Street Sportsplex and the Trampoline Zone & Adventure Park. Matt has been involved in helping Big Brothers & Big Sisters fundraisers and Boys & Girls Club of Central Oregon. He has donated his time to several Boy Scout Eagle Projects that benefit Bethlehem Inn, Ronal McDonald House and other charities. Matt is one of the most respected youth soccer coaches in Central Oregon. Matt is only 25 years old and is a fun and dynamic leader, friend, and mentor. He has coached and helped hundreds of youth in a range of sports and activities. Matt believes that leaders must lead by example. He inspires the people that he leads and manages with encouragement and inspiration. Matt communicates clearly and expects people to make their best effort and teaches “how to” on a regular basis and gives people the chance to govern themselves. Michael has quickly risen to the top tier in our industry earning the President Elite status which represents the top 8% of Coldwell Banker agents worldwide. He has earned the Certified Global Luxury Specialist designation which only 2% of Coldwell Banker Brokers worldwide have earned. Michael is also a licensed Principal Broker in Oregon showing his dedication to his profession. Michael is a Board member of Rotary International, a Rocky Mountain Elk Foundation committee member, 4-H, Deschutes Children’s Foundation and involved with Journey Church. Michael is an outstanding young man and those fortunate enough to know him quickly recognize he has a true gift of compassion, integrity, and character. It’s no surprise that Michael is loved and respected by his peers and receives rave reviews from his clients. His attention to detail, intelligence and professional skills are quickly recognized by his peers. Michael’s dedication to his community, his profession, and serving others distinguishes him from his peers. Michael is very humble and leads by example. He is a leader not only in the community but within our company and has earned the respect of all our brokers, management and owners. I greatly look forward to watching Michael continue to achieve incredible success. Nick is the founder and co-owner with his sister, Katie, of Cascade Street Distillery in the heart of Sisters, Oregon. Nick began in the industry while attending Oregon State University but has worked and moved Cascade Street Distillery into Sisters, Oregon since 2015. Being open for a little over three years Nick has developed five spirits (Broken Top Bourbon Whiskey, South Sister Gin, North Sister Vodka, Cascade Potato Vodka and Cascade Chipotle Pepper Vodka), that Cascade Street Distillery currently sells across the state of Oregon in state liquor stores, and a few other states across the PNW including Washington, Idaho, Arizona, Nevada, and soon to be California. CSD also began working with Opportunity Foundation, which empowers people with diverse abilities in the workplace. Nick is an active community member in the Sisters area. When he is not working, he has spent the last two years as a voted in member on the Chamber of Commerce board for Sisters, as well as being voted in on the Black Butte Ranch Board of Directors starting in 2017. Volunteering his time to help improve the communities for its homeowners, visitors and business owners. Nick is a hard working business leader. Always trying to find a solution in the workspace while also trying to create as many local jobs as possible. Nick never wants to say no to a customer or work associate and wants to find a way that would make it work. Nick is a very reliable, local community member that only wants to see Sisters, Oregon and Central Oregon succeed, not only in his own line of work but with other local businesses as well like craft breweries, cideries, restaurants, bars and local charitable auctions. Central Oregon has always been a special place to Nick and with his company, he wants to share it with the world. Since graduating from Oregon State University in 2014 in Business Entrepreneurship, Nick has started his own company, and quality has always been the main goal. Providing unparalleled customer services and experiences. Using the landscape of Central Oregon and natural resources incorporated in each product helps deliver that same experience outside of Oregon. Creating small batch, craft liquor as well has having a family owned and operated business. Preserving parts of Sisters history by restoring the old Barclay Barn into a function warehouse as well as reclaiming the wood from the previous barn. Nicks business leadership philosophy is to encapsulate Central Oregon. Ruth serves as marketing specialist for Central Oregon’s largest commercial real estate firm where her experience in SEO has increased web traffic by 20% helping spotlight clients’ listings. She is a former editor of three photography books, a children’s book, and managing editor for an international bridal magazine. Ruth is a program committee member for City Club, A Toastmasters Competent Communicator certificate recipient, a regular volunteer at Compass Church and a representative of Compass Commercial at community events. Ruth is a life-long learner and committed worker. She has an eye for detail that is a benefit to clients and the company. She strives to help others realize their potential and reach personal goals. Ruth’s business leadership philosophy is to lead by serving. She demonstrates this through listening, identifying end goals and problem solving to achieve the best outcome. Besides learning English at the speed of light, Sanda is the owner of two businesses: Bowtie Catering Co. and Citizen Bar & Kitchen. While running two businesses, Sanda makes time to cater meals to nonprofit organizations, city offices, ribbon cuttings, rotary clubs etc. and she belongs to professional groups that are focused on supporting the entire Central Oregon community from Madras to Sisters to Prineville and La Pine. Romanian born, Sanda is one of the youngest, female multi-business owners in Central Oregon. She recently received her American citizenship making her also stand out from the rest. Sarah Stevens is the Director of Human Resources with Knife River Corporation – Northwest. Sarah has been with Knife River since 2005. She is responsible for the overall development and maintenance of Human Resources policies and programs. She serves on the NW Region Executive Team working on strategic initiatives for the business. Sarah has a bachelor’s degree in psychology and a minor in business and public administration from University of Puget Sound, and a master’s degree in business administration from George Fox University. She also has her Senior Professional in Human Resources Certifications (SPHR and SHRM-SCP). Sarah has served as vice chair for the Deschutes Children’s Foundation Board of Directors, volunteer for the Heart of Oregon Corps Employer Advisory Committee, and Leadership Bend, Class of 2013. Formerly chairwoman for the Funds Distribution Committee, board member of the United Way of Linn County, member of the Women’s Advisory Board for MDU Resources and a youth soccer coach. Sarah is dedicated and passionate, demonstrating strong loyalty to the people and causes she cares for. Her skill and expertise in Human Resources give her an empathetic perspective for people and their unique circumstances. Her collaborative and thoughtful approach to problem solving is an asset in both her professional and volunteer roles. She is respectful of each individual’s needs and challenges. Despite the demanding nature of her work, she can prioritize her family, her volunteer commitments and her friends. Sarah believes in building relationships and achieving meaningful work in both her professional life and volunteer commitments. She is driven and maintains high standards while enjoying the process and achieving successful outcomes that benefit all parties. A natural leader, Sarah leads by example and believes in creating an inclusive and positive culture and a healthy work/family life balance. Sarah has a strong moral compass, and approaches all business decisions from the perspective of doing the right thing for all parties involved. Sean developed and implemented a multi-state distribution coffee roasting and brewing company. Sean hustles HARD, and always has a dazzling smile on. In just over two years he’s acquired accounts like Whole Foods, Chow, and Black Rock; not to mention all the out-of-state businesses, who carry his nitro cold brew. A portion of sales from Coffee 4 Kids goes to an orphanage in El Salvador. Sean travels there one to two times (or more) a year and volunteers in a way that changes lives. Sean is passionate and ridiculously driven. Never scared of the word no and has thrived since starting his own business. He employs many people in the community and it grows more every year. His enthusiasm for the product is infectious and integral to his success which makes him so different and special. Sean won’t ask his employees to do anything he wouldn’t. He is first on the job and the last to leave. Sean never really shuts off when he’s up to do a deal and is always finding a way to bring it back to the kids. He is a visionary with a heart of gold – resilient and persistent! Shannon started her business development journey in the senior care industry doubling two different in-home care agencies revenues. She is now part owner and general manager for Ideal You Weight Loss Center and since starting there in 2015, has grown that business rapidly as well. 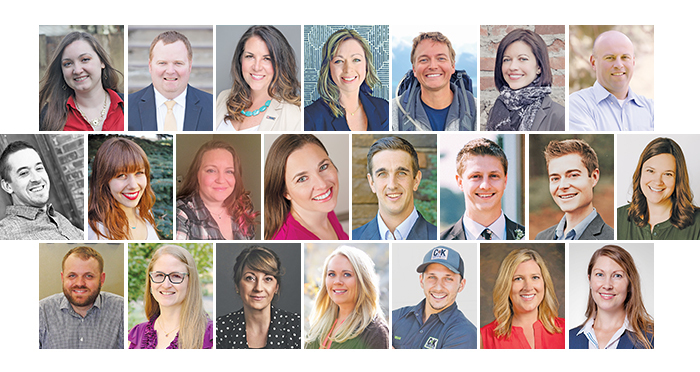 Shannon is active with the Bend Chamber of Commerce Young Professionals Leadership Team. She is a Rotarian and is a board member of The Rotary Club of Greater Bend. Shannon brings commitment, energy, intelligence and focus to all that she takes on. Leading by example and placing the needs of others first, earns her the trust and respect of her peers and creates excitement among them. Shannon believes that taking care of her employees comes first. They are her team and their well-being is very important to her. She leads by example and does her best to make her employees feel equal and important. Without a healthy team there would be no growth. That is why it’s her first priority, then comes growing and branding her business. Stephanie is originally from Montana but has happily made Central Oregon her new home. While she has only lived here for a few years, she has made an immediate impact on the legal industry. Stephanie has been named in Super Lawyers as well as a Rising Star-Civil Defense in 2018. Stephanie is a member of the Oregon Association of Defense Counsel and was previously on the Board of Directors of the Montana Trial Association. Stephanie works hard to put her client’s needs at the top of her priority list and her legal expertise makes her an invaluable asset to the legal industry. Her aggressive and passionate approach to each case produces results in a timely manner and keeps clients impressed and satisfied. Stephanie goes the extra mile to be the most knowledgeable person in the room about her case and clients. She is committed to being accessible to her clients and she ensures that every legal issue is addressed and taken care of to its fullest capacity. Trisha is an accomplished interior designer, serving as a member on the Council for Interior Design Qualification. With over a decade of experience, she specializes in developing, coordinating, and completing tenant improvement projects. She has an exceptional eye for detail, superior client service, and creative problem-solving skills. She is a candidate for the 2018/19 Leadership Bend cohort, Miller Elementary’s PTO, a former volunteer with the International Interior Design Associate and served on Washington’s Interior Design Coalition. At Ascent, our motto is, “do better.” Trisha demonstrates this philosophy by continually striving to improve herself, her surroundings, and her career. As an excellent communicator and team-player, with strong values and problem-solving skills, Trisha is eager to become more involved and to elevate our firm and our community.